The world of massively multiplayer online games keeps getting, well, more massive. We've come a long way since I first picked up the genre eight years ago. World of Warcraft may still dominate the traditional monthly susbcription market, but free-to-play multiplayer worlds of all kinds boast tens of millions of subscribers worldwide. At E3 last week, I saw demos of a half dozen games each claiming to be a unique, fresh entry to the space. The interesting thing is, in a sense, they all really are. Every game I saw was easy enough to sit down at and pick up the basics of, but each and every game I saw also had at least one surprising or new-to-me feature, whether in settings or skills. From singing to space, here's a look at what unique features RaiderZ, Otherland, Grimlands, and 3000 AD: Line of Defense bring to the table. I almost missed out on RaiderZ, but I was running early for my appointment to play Neverwinter, and Perfect World was able to put me on RaiderZ in the interim. It began more or less as I would expect from an MMO: the three of us playing the demo sat down at stations loaded and ready to go with warriors and mages in spiked armor and bare midriffs, running around a grave-covered area and swatting at skeletons that refused to stay dead. Then we started making salads, and it got interesting. As a monster-hunting game, RaiderZ is all about the boss fights. They are many, and they are everywhere. Map regions have them galore, and most bosses wander about. As the point of the game is to kill the bosses, and as they spawn in overland areas as opposed to instanced dungeons, competition for some is likely to be fierce. 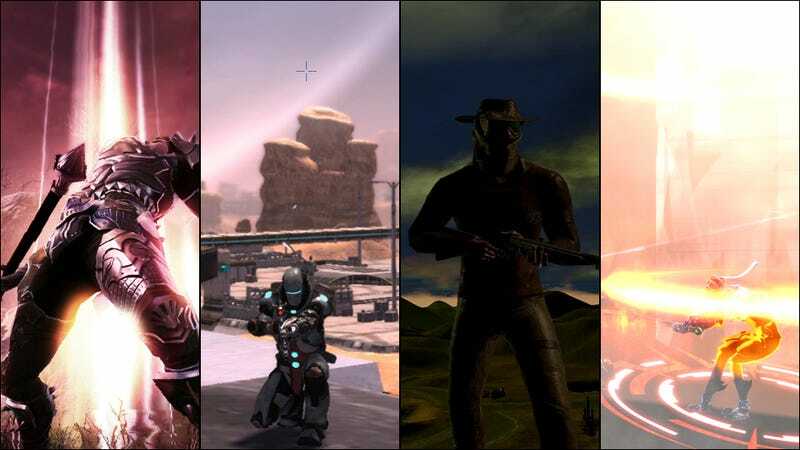 The developers agreed that spawn camping was a concern, but that so far, in early testing, there had been enough interesting zones that players spread themselves throughout the world enough to keep having fun. RaiderZ promised the now-popular class-free leveling, explaining that yes, you start from a base job but then you pull skills from wherever you like to make a character that suits your skill. I was playing a sort of damage mage type, but to test what they meant I grabbed a sword and tried on some fighter skills, as well as leveling a heal. That heal never did quite work right, but my mage turned out to be surprisingly competent as a sword-and-board fighter. The most unusual thing I saw in RaiderZ, though, was the high degree to which players are expected to work together while not in combat. There are two main mechanisms through which players receive buffs, boosts, and benefits: music and food. Your inventory is practically a refreshing tavern on the go. Bemused, we followed a producer's instructions to open our bags and look for salads, roasts, and other food items. When deployed, they made work tables, around which we stood to prepare a banquet. Then we could each sample from all the tables in the area, gaining nourishment from what we'd cooked there. After the feast, we once again opened our bags and were told to select from an array of guitars we found there. Our avatars stood around together, under a tree, singing. The longer we stuck with it, the more unified the music got. And the more unified the music got, the stronger the benefit to the group. I've seen bards in plenty of games before, but never anything quite like that. RaiderZ is aiming for a release late this year. You can sign up for the beta at their official site. When I sat down to observe Otherland, I couldn't help but notice that the player character was wearing boxer briefs, a conch shell hat, and nothing else. And as he wandered through a giant shopping promenade sort of area, I realized that all the NPCs hanging around, while generally wearing more clothes than the demo character, were not necessarily wearing more normal clothes than the demo character. This turned out to be a surprisingly apt metaphor for Otherland, which had far and away the widest array of settings I've ever seen in a single game. From peaceful sky-islands based on the traditional Chinese elements (wood, fire, water, earth, metal) to a war-locked hell where floating chess pieces represent a never-ending battle, to a neon strip half Las Vegas and half Blade Runner, Otherland threw startling variety at us in just fifteen minutes. And that's not even taking into account the huge array of locations that players and groups of players will be able to build and customize for themselves. The game is designed as the extension of a book series by the same name. The sci-fi, cyperpunk nature of the world that author Tad Williams posits is not entirely unlike the concept of The Matrix or of Snow Crash. The player character is aware that she or he is travelling through virtual worlds, but NPCs don't know they're not real. Because the world of Otherland is virtual (well, all game worlds are virtual, but you know), PvP interaction takes place in the form of hacking. That is, a hacking minigame inside the game as opposed to the other, less pleasant sort. Clans of players can hack into each other's bases (basically, guild housing) and invade that way. Alas, we did not get to see either traditional combat or the fine art of hacking a virtual planet in the time allotted at the demo. But the feeling I got was that in Otherland, those are almost secondary. First and foremost is expression. The game seems to be the work of those who, like me, were once children disappointed that the holodeck we saw on TV wasn't a real thing and so went and made a game as close to one as they could. Otherland is targeting a "late 2012" launch; their official website is here. If that screenshot looks kind of Fallout to you, you're not alone. And it's okay. That's the vibe Grimlands is going for. It's a post-apocalyptic sandbox, and those words are music to my ears. The world has gone to hell and you are one of the survivors. It's you, a desert full of hostiles, and whatever weapons, shelter, and vehicles you can scavenge, barter, and build. Not only does Grimlands promise a class-free leveling system, it also promises to make skills relevant and use-based. For example, you may be good with a pistol, and use it often. Your pistol skills will level. The next week, you find a sniper rifle you love, and you start playing differently. You take up sneaking and sniping, moving slowly and keeping to the shadows. Your stealth skills and sniper rifle skills will increase the more often you play this way, but after a time, your pistol skills, left unused, will atrophy. The same applies to all skills in the game: scavenging, crafting, combat. And scavenging, crafting, and combat are all integral to survival in this world. Players can band together to form towns, with full utilities and services. Those towns—out in the open—are in many ways Grimlands's equivalent of guild housing. Citizens of the town gain benefits from being in the town. It's their environment, and it protects them. Naturally, other players will want to wrest control of a particularly nice town from the alliance that owns it. Grimlands is aiming to start its closed beta later this month and its open beta late in July, with a full launch this fall. You can register or learn more here. The last MMO I saw, Line of Defense is the latest project from Derek Smart, a somewhat controversial figure in the game design world. I haven't played any of his previous games, so I had no immediate point of comparison to the more niche space shooter titles that he's made in the past. But what I can say is that Smart is an absolute fountain of enthusiasm and passion about Line of Defense, eagerly wanting to show me every inch of the game's world. The thing is, the game's world is HUGE. And that's its best selling point. The scale of Line of Defense is staggering, and it's built to accommodate even more areas being added over time. Smart promised me, "It's the largest world you've ever seen in a game, period." I don't have the math to research his claim, but at the very least, it's plausible. Luckily, no-one's expected to travel all over entire planets on foot. The game's all about vehicles: land vehicles, air vehicles, jet-packs, fighters for star-hopping... in a demo build, they're lying about everywhere, like so much diesel-driven candy. In the live game, naturally, they'll cost you. Line of Defense plans to take a split approach to the "time vs money" model. You can either pay for the client, and have a bunch of perks enabled to start with, or you can download the free version, and put either significant time or nominal money into acquiring the stuff you want. I asked if the story mattered, and Smart laughed, confirming my "no." The red guys and the blue guys are locked in a state of warfare, and as a red guy you'll be shooting blue guys, and vice versa. It's a PvP-only massive killfest, on a galactic scale. You'll be shooting the guys in space, in massive bases (planetside and orbital), and on land. You'll do it tactically, by taking out comm towers after making sure your team all have personal comm devices, or you'll do it with brute force, just blowing everything up. You can do it with paratroopers and infiltrators, with bombers and rockets, or with pretty much any other tactics in between. Line of Defense is aiming to start its beta in July, and to launch sometime in Q3 of this year. You can find more details (including a very thorough FAQ) on the official site.